This tour departs from Cala Bona, Cala Millor, Sa Coma, S'illot, Cala Ferrera, Cala D'or and Cala Egos. Take a day trip to the charming market town of Sineu, the oldest and most traditional market on the island of Majorca. Get a glimpse into the real, traditional side of Majorca on a visit to the market at Sineu (pronounced Sin a you). This quaint agricultural hilltop town comes alive every Wednesday for market day. 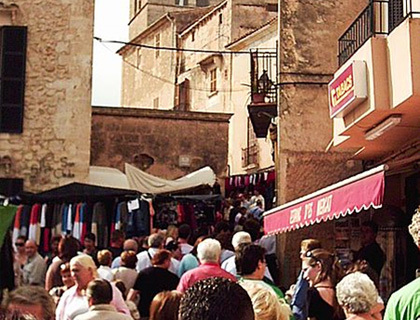 The streets throng with visitors that come to buy, see, breathe and experience one of Majorca's most diverse markets. Sineu market has been going the 14th century, making it Majorca’s oldest market. After leaving Sineu Market you’ll visit the spectacular, eerie Caves of Drach, one of the most beautiful and popular attractions in Majorca. Here you’ll see stalactites and stalagmites which have formed over hundreds and thousands of years. Enjoy a short classical concert on a beautifully lit underground Lake Marte. Spend some free time exploring Porto Cristo before the journey back to your resort. After leaving Sineu Market you’ll head to Majorca’s Pollensa District, famous for being home to many famous impressionist painters including H. Anglada Camarassa or Tito Cittadini. From the Port of Pollenca your next stop is the famous Formentor Beach, with its clear waters and soft white sands. Here you’ll enjoy a half-hour boat trip between Formentor Beach and the Port of Pollensa (weather permitting) before heading back to your resort. Wednesdays from April to October.